I think I have just died and gone to a nostalgic yoghurty-covered heaven. Seriously. You don't know how long I have been waiting for this moment. I have managed to get my hands on these (thanks to the amazing Total (fage) Greek Yoghurt company)! They also sent me this amazing coolbox with loads of little icepacks; great for a picnic! They may just look like any old yoghurt to you but these are amazing. They are so amazing that when I scoured every supermarket in a 40 minute radius looking for them and couldn't find them, I managed to persuade my mother to sneak one in her hand luggage when she came over from Cyprus last year. Well seen I devoured it the second she arrived. Right, maybe I should backtrack here and explain myself a bit first before my excitement reaches the roof. 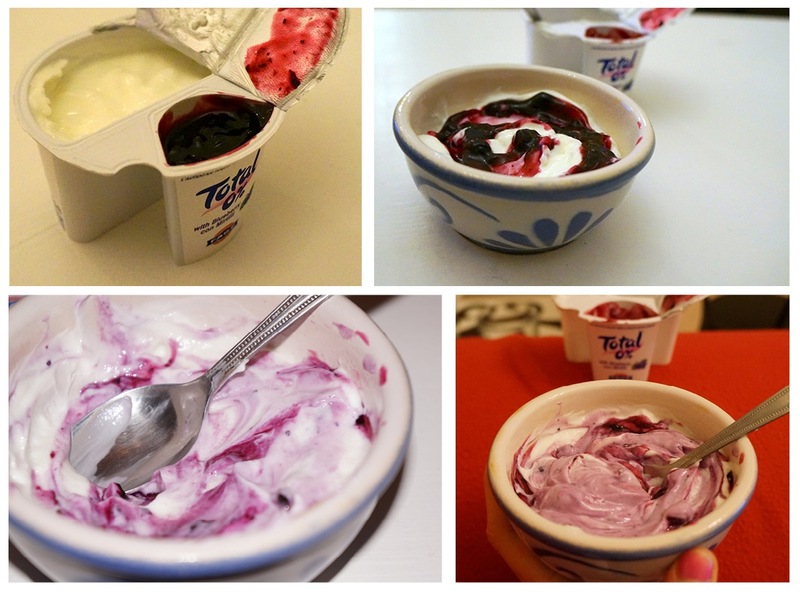 When I lived in Cyprus, I used to get fage Greek yoghurt split pots (my favourite being blueberry and pomegranate); these were 100% Greek yoghurt on one side and a fruity compote on the other. They were my favourite snack, especially on a warm summers day, and my father and I used to fight over them! Anyway, when I had to move back to Scotland for university, I noticed a TV advert showing that these were sold in the UK; I was so pleased that I would be able to keep a little part of home! When I got here, however, I couldn't find them anywhere! I even bought a months supply to eat in a week when I saw them on holiday in Dubai. But anyway, enough of my ramblings. They are finally here! Try the strawberry split pot with some fruity ryvita and chopped up apple for a super filling breakfast (or dessert)! If you aren't too keen on thick yoghurts, simply mix in some water! I tried this with the raspberry variety and it still tastes great...and lasts a bit longer too! You may think I'm going OTT here, but don't judge until you try them! These pots come in four 'total'ly (see what I did there?!) delicious flavours: a traditional sweet honey, a sweet strawberry compote, a tangy blueberry compote and a new flavour (my favourite), raspberry and pomegranate. As you can probably see, each pot is 80% yoghurt and 20% compote/ flavour. Nutritionally, each one contains approximately 150 calories (the honey one contains a bit more), 0g of fat (!) and around 21g of sugar as well as 14g of protein(!!!). Greek yoghurt has so many health benefits including live cultures and friendly bacteria; read my superfood Greek Yoghurt post here to see more of its benefits. Oh...and be warned! They aren't just for us health freaks! My dad and little nephew love them too ... I caught them having one of my honey flavoured ones! So I'd hide them if I was you! Have you tried these? Can you buy them where you live? What is your favourite flavour if you have tried them? Americans and Canadians... I see you have a lot of flavours we don't have here in the UK! What are they like?! By the way! 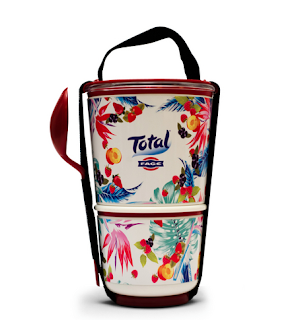 I spotted this on the Total Greek Yoghurt facebook page this morning and I want it so much! Another one of my obsessions is bento boxes and black and blum are one of my favourite companies that create them (I already have 2 others from their range). So could it really get any better?! Black and Blum and Total Greek Yoghurt? The only problem is the price added to my student spending mindset...it's a little over budget at £25. It is a limited edition thing though; I think only 100 have been made and all proceeds go to charity. What do you think guys... should I buy one?! Help me decide!